Bring more patrons to your pub like these famous hotels did! Outdoor spaces at pubs and hotels are often underutilized. What’s happening in the outdoor area of your pub? Is it the place which creates additional revenue? Many hotels offer outdoor entertainment, bringing in live bands, and organising activities for kids. It becomes increasingly popular to offer guests watch live sports events on a really big screen, which is placed on the lawn near the pub or hotel. 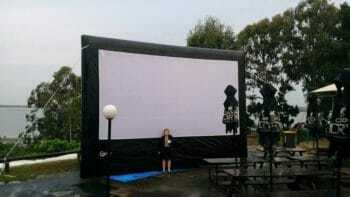 Outdoor movie screen is just one of the many secrets behind Redland Bay Hotel’s popularity. 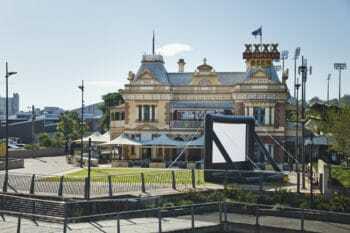 Famous Breakfast Creek Hotel invites their guests for a State of Origin party with a 6×5 m screen erected on their lawn. What would an outdoor cinema give you, as a business owner? 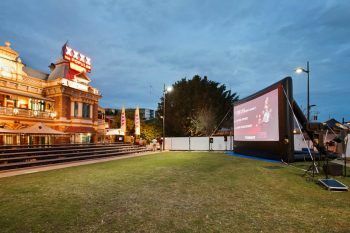 Bring outdoor cinema to your venue and make your customers talk about you. Combine the show with matched food and entertainment – and you’ve got the unique experience for your guests – a winning combination! Use outdoor movie screen to watch live sports and on-air TV. 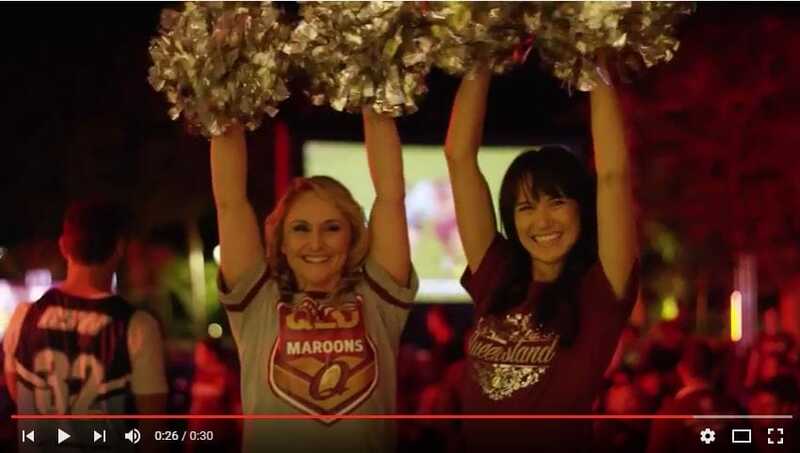 Organise State of Origin evening, the way Jupiter’s Casino and Breakfast Creak Hotel are doing. Stream live Ultimate Fighting Championship, Australian Open, or Olympics. Invite patrons for a thematic movie night. Select the menu and drinks to match those consumed in the film for a special experience. Organise a family night with kids activities and family movie – make your place more kids friendly and attract visitors during school holidays. Make it live and loud! Offer a special day for the gamers and run a console game competition. Offer a prize. Announce a really big karaoke night or simply use the big screen to show music videos. Unique experience makes your business stand out from the crowd. But what are the costs? We suggest investing in inflatable movie screens. They are several times cheaper than LCD, and can be huge – up to 12 metre wide! Big screen means big WOW from the audience, and big sound with quality picture is also supplied. tate of Origin or AFL games outdoors is so similar to being at the real sports stadium! The size of the screen is determined both by the space available at your venue and by the size of the audience. Expecting several hundreds of visitors? Choose from 4, 5 or 6 metre packages. Having a tiny beer garden? Go for 2.5 or 3 m screen – it will look great and is extremely portable and lightweight. Setting up inflatable movie system is plain sailing, and, depending on the size, can be done by 1-2 people within 10 minutes to half an hour. The screens are wind and water proof, and can be taken indoors if required. Apart from the screen, the outdoor movie system includes a bright HD projector, a pair or two pairs of mighty speakers, and a small audio video control unit we call SmartBox®. Put the Blu-Ray or DVD disc in, control your sound, catch on-air TV and use the microphones for announcements and karaoke – all audio video control equipment is mounted in the rack case. SmartBox® makes running the show super easy. All you have to do is plug the equipment and let the show begin! Offer unique experience to your guests with big outdoor movie screen. Make your hotel or pub the best place people choose to watch live sports and spend hours having fun!